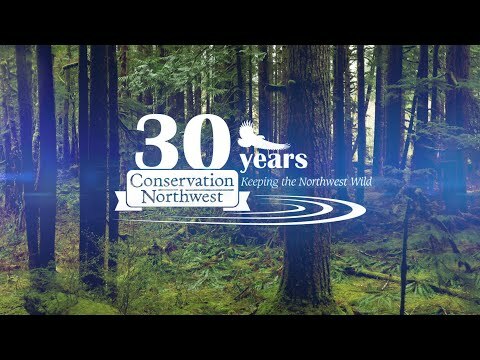 When you think of the animals that Conservation Northwest works to protect and restore, what comes to mind? You may have a mental image of wolves, grizzly bears, or fishers. While it is true that our organization has placed emphasis on recovering historically-persecuted and nearly extinct carnivores in Washington, through our Sagelands Heritage Program we’re also quietly working to help conserve a different kind of native species, one of the hoofed variety: the bighorn sheep. Not to be confused with mountain goats (which have white coats and spiky horns), the bighorn (Ovis canadensis) is the largest wild sheep in North America, sporting fawn-colored coats and dense, tightly curled horns that display status and age. A large ram can over 300 pounds, and his horns up to 30 pounds – more than the weight of all his other bones combined. As with some other ungulate species, rams and ewes typically inhabit separate herds. Rams travel in bachelor groups and fight for mates in the fall by using their horns and thick skulls to crash into each other head-on. Three subspecies of bighorn sheep exist in North America, including the Rocky Mountain (or mountain) bighorn (O. c. canadensis), and the endangered California bighorn ( O. c. sierrae) and desert (O. c. nelsoni) bighorn. Only Rocky Mountain bighorn sheep are found in the Pacific Northwest. Two other closely-related species of mountain sheep, the Dall sheep (O. dalli) and Stone sheep (O. dalli stonei), reside in western Canada and Alaska. Today, about 1,700 mountain bighorns range in approximately 18 herds across parts of Eastern Washington, particularly in the canyon country of southeast Washington and the eastern slopes of the Cascades, but they once numbered at around 1.5 – 2 million throughout the American West at the beginning of the 20th century. Today, 70,000 exist throughout the Western states. Historic overhunting, habitat loss and, most significantly, the spread of the pneumonia pathogen from domestic sheep to wild herds led to the extirpation of bighorns from Washington by the mid-1920s. It is only thanks to reintroduction efforts that our state once again has this native species roaming our landscapes, but the threat of disease still looms over the long-term success of the bighorn. As the West was settled with landowners and livestock ranchers, the onset of domestic sheep grazing in close proximity to wild bighorn herds led to the transfer of the pneumonia bacteria Mycoplasma ovipneumoniae from the former to the latter. Domestic sheep can carry the pathogen with relatively minor effect, but bighorn sheep, who never evolved immune systems that could effectively combat it, were unable to withstand this non-native pathogen. The disease is now the largest threat to bighorn populations in North America. According to the Washington Department of Fish and Wildlife’s (WDFW) bighorn lead Rich Harris, WDFW has focused on building partnerships with small-scale domestic sheep owners to decrease the spread of pneumonia from their backyard flocks to bighorn sheep. This work includes the creation of a pathogen-free sheep flock owned by WDFW and located at the Washington State Penitentiary. Still in its early stages, this pilot project will allow willing sheep owners to replace pathogen-carrying sheep in their flock with pathogen-free sheep from WDFW’s herd, which will be cared for and managed by trained incarcerated individuals at the penitentiary. Swapping out pathogen-carrying sheep in flocks when possible is one step towards healthy coexistence between domestic sheep and bighorn herds. The U.S. Forest Service is also considering how to best ensure bighorn viability on National Forest land. The Okanogan-Wenatchee National Forest has recognized the need to undergo an Environmental Impact Statement process, which would analyze their current domestic sheep grazing allotments and explore ways to reduce the risk of disease transmission from domestic sheep to bighorn sheep within their jurisdiction. A public meeting was held last year to kick off the discussion on this forest, and the analysis has been prioritized to begin in Fiscal Year 2018. Our Forest Field Program is closely engaged in discussions preparing for this upcoming process. At Conservation Northwest, the conservation and recovery of bighorn sheep overlaps several of our program areas. Through our Washington Connected Landscapes Project, we released a scientific analysis showing current needs to maintain and restore habitat connectivity for bighorn in our state. Our newly expanded Sagelands Heritage Program will also aim to reduce barriers to bighorn movement and promote higher habitat quality. Through dialogue, support, and collaboration with wildlife and land managers, we’re doing our part to make Washington a viable home for bighorn sheep for years to come. There is a lot of work still to do, and Conservation Northwest will continue to advocate for and find solutions to maintain healthy populations of all native wildlife – including bighorn – in our region. For more information on bighorn herds in Washington, visit WDFW’s page here.